Remember what you paid as rent for your first apartment? That first rent payment probably felt like a real dent in your paycheck. But I guarantee you it’s not anything like today’s rents. Apartments have been on fire for a LONG time this cycle. While I think there is still room for this market niche to grow, it is nearing the top. Across the US, rents in some markets are going through the roof. A one-bedroom in SF is up to $3,300/month. 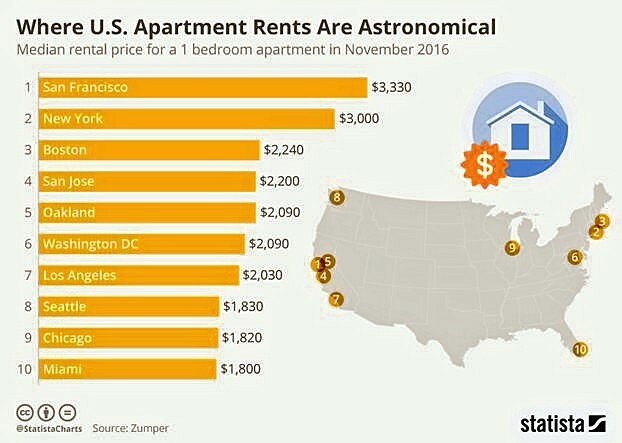 With the exception of Chicago, all of the top 10 highest rents are on either coast. Anytime a segment of the market gets too overheated, the inevitable market correction will come. When the market corrects, sky high rents will be one reason why. By the way, Phoenix’s median one bedroom apartment rent is $1,027/month, and a totally reasonable $698/month for Tucson. We represent office tenants but are always watching all real estate segments and how they affect our clients and the market in general. I have created a group presentation called Commercial Real Estate 101 that covers all segments of the market and the trends that affect each one. Call or email me if you are interested in hearing it.